I'm always telling my mosaic students that creating a mosaic is a process of solving problems, and my latest project presented me with a doozy. It was to be a small accent table with a simple geometric design of a Celtic knot taken from one of my design books. The client, a friend, wanted a small accent table, and after much searching, we finally found the perfect one at a local thrift shop, complete with a handy lip, as it had once had a glass top. It also has an aged faux-gold finish that we both like and my friend decided to keep. She likes blues and greens, so we settled on a soft lime green and turquoise blue for the outlines of the knot in 3/8-inch ceramic tile, and darker blue and green stained glass to fill in, with a hint of soft orange stained glass as an accent along with a few scattered round ceramic dots from a shop on Etsy. I thought, going in, that it would be an easy job of a few days. Silly me. My first hurdle was translating the design in my book to the size of the table, then I had to dust off the geometry section in my brain and remember how to use a compass. A further problem was how to draw the larger arc that connects the bottom of the four circles, since the center point of those circles falls outside the paper. Fortunately, I found a circular tray in my cupboard that was the perfect size — not very mathematical, but it worked! The part I struggled with the most was the center "knot"; it was the last section I tiled, and I must have scraped it up and relaid it four times before it looked right. It's (obviously) very different drawing lines that appear to be going over and under each other and setting tiles so it looks as if they are doing so. Another problem solved. Once upon a time there was a mosaic teacher whose students were all busy with their own projects, so she picked up a piece of wire and started twisting it into an egg shape. And the egg shape had a sort of tail. So she bent the tail up and it looked kind of cute. She kept mushing the egg shape around and squishing it and then wrapped it with wet plaster gauze and smoothed it out and let it dry until it hardened, and then she covered it in a couple of layers of some finely ground cementlike stuff called Winterstone - because when you glue mosaic pieces onto a form, it has to be absolutely rigid so the grout doesn't crack. Now, this mosaic teacher was already getting the idea that this thing was starting to look like a little mouse, so she remembered that she had a very tiny amount of some pink Van Gogh tile in tiny 1/8" squares, and she thought that would make a super mouse belly, and because green is pink's complement and also because dark green makes a good camouflage for a mouse scurrying around on the forest floor, she picked out a dark bluish-green glass for the mouse's back. 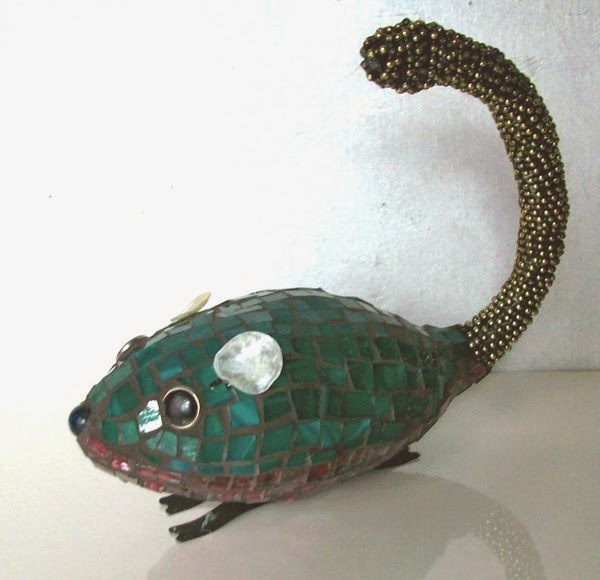 Because it was a sort of abstract mouse, and because she had some tiny gold beads on a string lying around, she decided to wind them around the tail all the way up so she could practice how to do that, not having much experience with beads. She consulted with her friend Diane Sykes, master bead wrangler extraordinaire, about whether to start at the top or the bottom, and received expert advice - definitely the bottom, said Diane! rummaged around again and found a couple of very tiny translucent shells and she had to admit they were totally perfect ears, and then before anyone could say, What about feet? she found two springs that go into the sides of picture frames - and Mousie was complete.